Wash the chicken breasts & cut them into strips or dice them. Put ginger- garlic pastes, light soya sauce, egg white, cornflour, maida, sugar in a bowl & mix well. Add boneless chicken pieces; mix well again & let it marinate for about ½ an hour. In a large wok, heat the oil till hot. Reduce heat to med., add the chopped garlic, green chillies; sauté for a few seconds & push it to the side of the wok. Then add chicken pieces in the centre of the wok & saute continuously till the chicken cooks evenly. Now add diced capsicum, dark soya sauce, rice vinegar & stir fry. Finally add chopped spring onion greens & coriander & toss. Adjust salt & pepper to taste. · It is important to use a non – stick wok if stir frying. 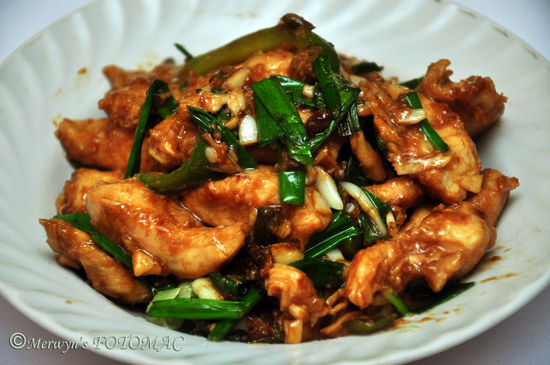 · If you wish, you can deep fry the marinated chicken pieces before stir frying with rest of the ingredients. · In case the chicken starts sticking to the wok you can sprinkle a little water or use fresh chicken stock if it is handy.